Meat Free Week, running from March 18-24 here in Australia, is a thoughtful new campaign aimed at, well, all of us. Don’t worry … it’s not about becoming a vegetarian or giving up meat for life. It’s about taking some time out to think about the amount of meat you eat and most importantly, where that meat comes from. Its long-term goal is to end factory farming and encourage consumption of organic and free range produce which includes other animal-sourced products such milk, cheese and eggs as well. The overwhelming majority of the meat eaten in Australia is factory farmed. The conditions are horrific; where animals are trapped, with no ability to communicate their misery and suffering. Factory farming disregards the fact that animals have an emotional experience of the world. It is focused only on the end result and achieving that end result, fast. As such, animals are kept in overcrowded pens and rarely or never see daylight. Factory farming causes the most suffering to the largest number of animals in Australia – more than 500 million every year. They have no voice, cannot defend themselves and are legally classified as ‘property’. While the cattle and sheep are not factory farmed in this country for their meat, there are plenty of associated welfare issues. If you want to know more, the Meat Free Week team has details on each of the specific animal welfare issues: chickens, pigs, cows, sheep, fish. Now, you have the power to make a change. How? As a consumer, you can make a change by asking questions when eating out and voting with your food dollars when shopping for food. Choosing to buy the food the way it is supposed to be; raised naturally, free-range and organic will send a message, loud and clear, to both ethical producers and those involved in factory farming. 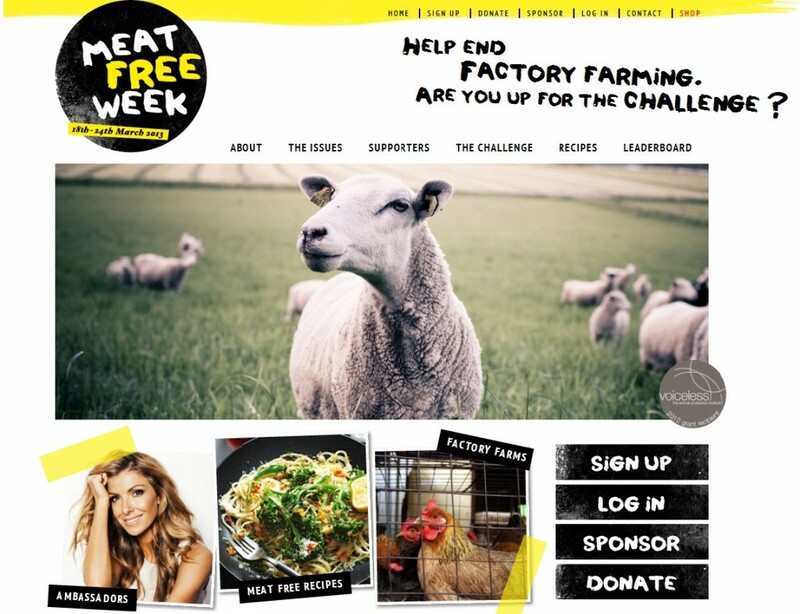 Try giving up meat for one week from the 18th to 24th March and ask some friends, family, work colleagues to sponsor you for each day you go without. Or reduce the amount of meat you eat and make sure to only buy organic and free-range. I thought I’d share these with you because whether you are planning the week’s menu without meat or looking to reduce your meat consumption in general, these are great places to start: 7 plant-based proteins and how to use them at Greatist; 44 fab vegetarian recipes at Meat Free Week including some nutritional myths busted on the sidebar; 72 yummy meat-free recipes at Foodwise and Meat-Free Mondays; 38 vegetarian and 28 vegan recipes right here at Wholesome Cook, 49 vegetarian recipes over at 84th and 3rd; Loads of vegetarian recipes on offer from Trudy at Veggie num num and An all-in-one vegan resource at Plant Powered Kitchen. 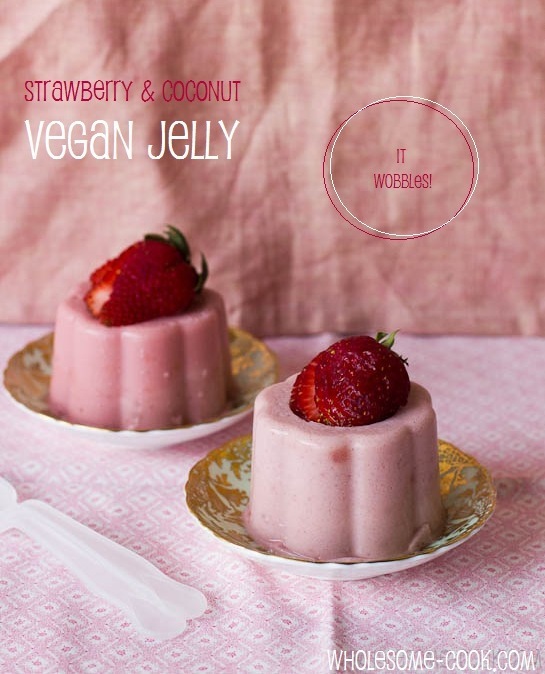 Last but not least is my Wobbly Vegan Jelly (see it wobble here). The following recipe comes from my Guilt-free Desserts eBook. Wash and hull strawberries. Cut in half and place in a jug or blender. Blend until puréed (I used my immersion blender for this). This should make about ⅔ of a cup seeded purée. Combine strained purée and coconut milk in the same jug and mix together. In a small bowl, combine the agar agar powder, kuzu and water until no lumps remain. Place a small saucepan or milkpan on the stove over low heat. Pour in the strawberry coconut mixture and add the agar agar mixture. While whisking continuously, bring to a boil. Remove from heat immediately. Grease two single-serving ¾-capacity jelly moulds with some oil. Pour prepared mixture into the moulds and place in the fridge to set; this will take around 1 hour. Remove jelly from the fridge and gently dislodge onto serving plates or bowls. Decorate with the extra strawberries, fanned, and serve. Kuzu is an organic, unprocessed and all natural gelling agent made from the dried root of the kuzu tuber. If you can’t find kuzu (most health or Asian stores should have it) you can use a ratio of 1tsp agar agar and 1 tbsp cornflour instead. If you don’t want to fluff around with straining the strawberries, you don’t have to as long as you don’t mind a little “texture” in your jelly. One thing to note, however: reduce the amount of coconut milk so that the quantity of the combined blended strawberries and coconut milk does not exceed ¾ of a cup. Other flavour combinations are also possible. Try your favourite non-dairy milk or, for a more basic strawberry flavour, use plain water. Hi Jennifer, I completely agree with you! We often stretch a smaller portion of organic meat with extra vegetables. 60-70 grams of meat per person is more than enough. I make it a point to purchase local, free range organic meats and poultry for my family. I’d rather spend a few extra dollars to support local ranchers who treat their animals with the care and respect that they deserve than support those farmers that practice dry lot/factory farming. I am in total agreement with you Martyna. Have a great week! Hey Martyna, thanks for a fabulous articles, I love all the links you have provided. I like to eat meat, but increasingly I’m trying to eat smaller portions of it and I really do try to buy the best that I can afford. I like to include at least a day per week where I don’t eat any meat or fish, just plant based products. I feel my body craves it too. A beautiful list, thank you Martyna! 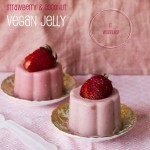 I will love that vegan jelly as we have a similar version in the Philippines which uses agar and pineapples. What a great initiative to be involved once again Marty! Like you I choose to buy organic meat, eggs and milk (some free range too) and just pad it out with extra veggies. that way everybody wins. 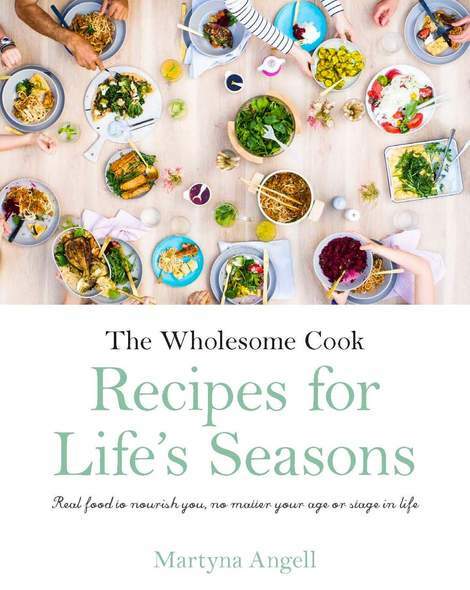 Thanks for the fabulous list – Even though it is Tuesday, I am going to try to be meat free for the rest of the week. I love this jelly – and I am keen to try out agar agar! Very pretty dessert! Happy to see kuzu in here. 🙂 I buy organic meat, eggs, milk these days. After having kids, I’m more conscious of what to buy. Compared to let’s say 10 years ago, organic and regular one has very similar price (used to be like double). People are making better choices for sure! Agar I’m familiar with but I don’t think I’ve seen kuzu before, now I’m intrigued. I was going to t some experimentation with agar agar to try and make a softer jelly. I love the Asian style jelly for some things but there are a lot of things that need a slightly wobbly texture. I’m keen to perfect a vegetarian panna cotta.